~~Meets 2nd Sat, Sept thru June, 1 pm at the Columbia Gorge Discovery Center, 5000 Discovery Drive, The Dalles. Meetings are open to the public. Special Collections include; an online catalog of local resources. ~~Meets 1st Mon of month from January through June, plus October and November. 7:00 p.m. at KCGS library. KCGS is a WA Non-Profit Corp. They maintain a library at 413 N. Main St, Ellensburg, WA. The library is staffed by volunteers on Monday, Tuesday and Wednesday from 10 a.m. to 4 p.m.; other times by appointment. Access available to subscription databases; Ancestry.com, Fold3.com, WorldVitalRecords.com and GenealogyBank.com. Research services are available. Special Collections include; a very complete collection of materials on Kittitas County. Service area includes; CleElum, Easton, Ellensburg, Hyak, Kittitas, Roslyn, Snoqualmie Pass, Suncadia, Thorp, Wymer and Vantage. ​ ~~Meets 1st Saturday of every month, 10:00 am at the YVGS Library, 1901 S 12th Ave (corner of Washington & 12th), Union Gap, WA. YVGS is a WA Public Benefit Corp. The YVGS Library is open to the public, Monday - Saturday, 10am - 4pm. YVGS is an affiliate Family History Library with the main LDS FHL in Salt Lake City. The library has an extensive holding of over 20,000 bound volumes, covering local, state, national and international genealogy, digitalized collections of published volumes, microfilm and fiche. 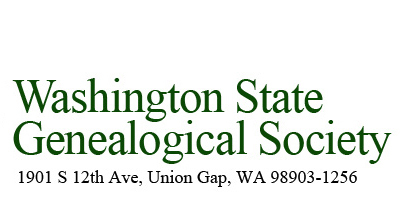 YVGS is the designated official library of Washington State Genealogical Society and Washington State D.A.R. Special Collections include; over 150,000 obituaries, funeral home records, cemetery records, land records, school census and more. Most of these are indexed online and searchable on their website. The Society offers several special interest groups, beginner and advanced genealogy classes. Service area includes; Naches, Tieton, Cowiche, Selah, Yakima, Union Gap, Wapato, Toppenish, Granger, Sunnyside, Grandview, Zillah, Bickleton, Goldendale, Gleed, Ahtanum, Tampico, Mabton and White Swan. It also includes the Yakama Indian Reservation.